Pencil, ink, gouache, and white paint on paper. 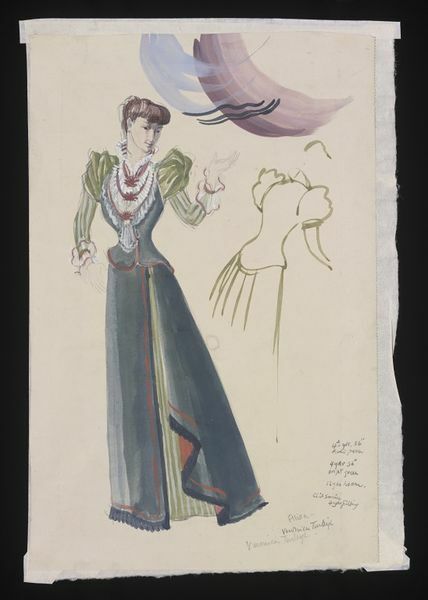 Costume design for Veronica Turleigh as Ellida. The design depicts a full length female figure wearing a late 19th century style costume. The costume consists of a tight fitting blue bodice and flared overskirt worn over a green and white striped blouse with "balloon" sleeves and skirt. The blouse has white flounces across the breast and at the cuffs. To the right of the figure is a painted outline showing the back view. Unsigned by the artist. The design has been glued directly onto a paper mount. This costume design by Maise Meiklejohn is part of an extensive collection of designs by the artist purchased by the Theatre Museum in 1990. The design was executed for a production of Henrik Ibsen's play "The Lady From The Sea" performed at the Arts Theatre, March 13th 1946. The production was directed by Judith Furse, and the text was translated by Eleanor Marx-Aveling. The cast included Veronica Turleigh as Ellida and Mark Dignam as Dr. Wangel. Historical significance: This design was executed for a production by the actor/producer Alec Clunes, whose greatest achievement was his direction of eight seasons of plays at the Arts Theatre during a period when money and actors were scarce and scenery hard to get. He introduced an ambitious and intellectually demanding repertory of unearthed English classics and promoted the staging of foreign plays, as an alternative to the usual West End fare of "leg shows" and average drawing room pieces, which earned him the status, according to one critic of "pocket national theatre". 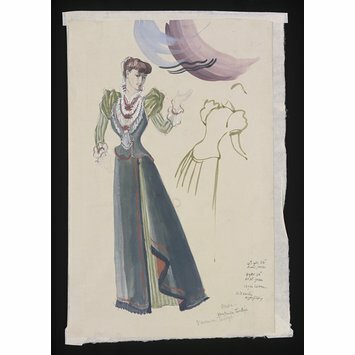 Costume design by Maise Meiklejohn for Veronica Turleigh as Ellida in "The Lady From The Sea", Arts Theatre, March 13th 1946.